Time to bundle up for school!! Parents and students must prepare for all types of weather to ensure student safety while going to and from school. Please plan ahead for slippery roads, rain and snow conditions, and cold temperatures as you prepare to drive or walk to and from school or wait at school bus stops. Our goal is to provide a safe and consistent learning environment and keep schools in session. When roads are passable, buses are running, and school buildings are warm, we plan to keep schools in session. Cold weather can be managed through proper attire. The school administration counts on responsible parents to ensure students are dressed warm and stay safe while getting to and from the bus stop or school. Working together and planning ahead will keep us all safe as we move through this winter weather season. -Wear a hat, preferably one that covers your ears. Most of your body heat is lost through your head. 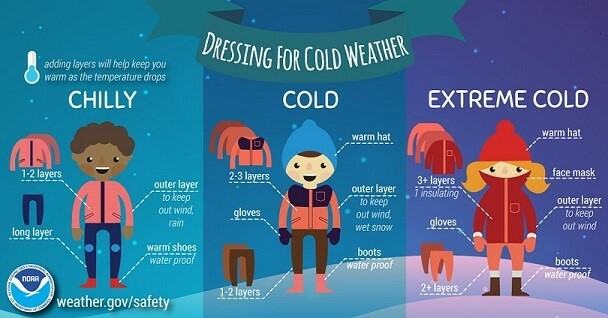 -Dressing in layers helps you retain heat. Outer garments should be tightly woven and water repellent. -Mittens provide more warmth to your hands than gloves. -Wear waterproof, insulated boots to help avoid hypothermia or frostbite by keeping your feet warm and dry and to maintain your footing in ice and snow. -Parents please provide supervision of students at bus stops and when walking to and from school. -Winterize your vehicle and keep the gas tank full. -When driving, maintain a supply kit in your vehicle that includes additional warm clothing and blankets. -Make sure you plan ahead and leave early, taking your time as you travel.